In addition to its entertainment value, the family theater’s also become a valued tool with which the president may drive his political agenda. For instance, while fighting to pass the No Child Left Behind Act, George W. Bush invited Ted Kennedy to attend a viewing of Thirteen Days (2000), which favorably depicted JFK’s handling of the Cuban missile crisis, as part of a successful campaign to enlist the senator’s support. Here’s a quick look at the remarkable history of this unique film-going venue. 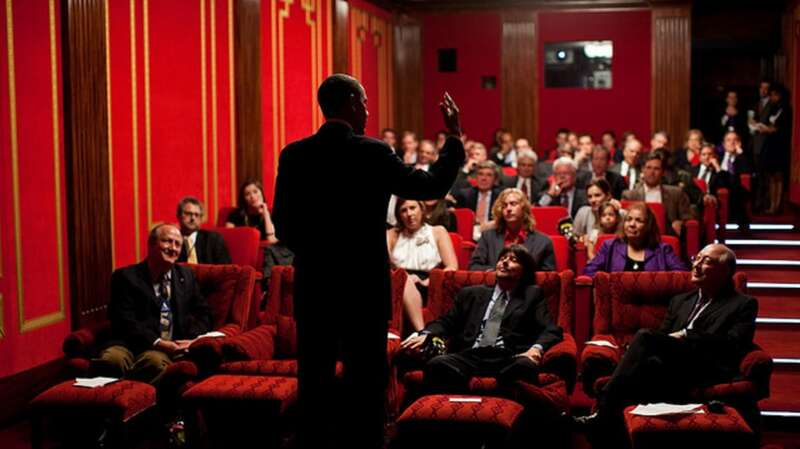 Films were being shown in the presidential mansion long before the Family Theater was ever conceived. The Ku Klux Klan’s propaganda masterpiece has the distinction of being the very first shown there, during a special viewing for the Wilson administration in 1915, which the 28th president enthusiastically praised. Ike was quite fond of westerns, which were all the rage during the '50s, and took in several dozen of them while in office. But after perennial western star Robert Mitchum was arrested for marijuana possession, Eisenhower refused to watch any movie that gave him so much as a cameo, getting up and exiting the theater every time he spotted the acclaimed actor’s face on screen. According to most of his staffers, Kennedy rarely sat through an entire film, but seemed to relish the James Bond epic—possibly because the original novel was one of his favorite books—which he took in on November 20, 1963. The next day he left for Dallas, and on November 22, he was assassinated. Narrated by Gregory Peck (who later earned a Presidential Medal of Freedom from the Johnson administration), A President’s Country (1966) was a 28 minute documentary focused on LBJ’s childhood and was distributed to American embassies worldwide. Though it was never released commercially in the U.S., Johnson watched it 12 times during his term. In addition to being widely regarded as one of the greatest biographical films of all time, Patton (1970) was a movie about which Nixon could barely stop talking. His ravings became so notorious that not only did Secretary of State William Rogers describe him as a “walking ad” for it, but the president later had to deny allegations that Patton had influenced his decision to invade Cambodia since he’d screened it twice in the days leading to the campaign. You might think former actor Ronald Reagan would have taken in more films during his administration, but his predecessor managed to squeeze in over twice as many, despite only having one term to work with. Carter watched 480 movies during his stay in the White House, including the controversial Midnight Cowboy (1969), the first X-rated movie to be shown in the Family Theater (though its rating had long-since been changed to R by the time of Carter’s screening).